the legislative part [is] managed by a select number chosen from the whole body, who are supposed to have the same concerns at stake which those have who appointed them, and who will act in the same manner as the whole body would act were they present. In mixed Governments there is no responsibility: the parts cover each other till responsibility is lost; and the corruption which moves the machine, contrives at the same time its own escape. The arguments and republicanism of Paine underpin Tone’s arguments, though he carefully avoids criticising the monarchy. Tone notes, as did Swift before him, that Ireland has plentiful resources, yet is poor and unknown. The blame for this he lays at the feet of poor government, and underlying that, internal division. Ireland, Tone says, has no real government. The Grattan Parliament (dating from 1782) has insufficient powers and, as Paine would expect of a mixed government, is corrupt. Instead of the English government directing it, or acting over its head (as in the earlier Woods halfpence affair), Westminster now bribe members with benefits draw directly from the Irish purse. Irish trade and industry is still restrained (just as it was in Swift’s and Berkeley’s time) for fear it affect English trade interests. Tone reiterates (as Molyneaux and Swift did) that Ireland is subject to the same King as England, but that that does not imply Ireland is (or should be) subject to the nation of England. To counteract this, Tone asserts that the power of the Irish people needs to be strengthened, so they can prevent such attacks on their prosperity. Reform of the parliament is discussed in England, but how much more urgently (says Tone) is it needed in Ireland. Of the four million population, three million as Catholics are not represented at all. Of the remaining one million, only 60,000 are electors, returning just 82 members of parliament. Thus, Tone says, no reform will be “honourable, practicable, efficacious or just”, if Catholics are not permitted the vote. This is a point at which Tone’s arguments sharply diverge from those likely to be supported by Swift. In a word, the alternative is, on the one hand, Reform, and the Catholics, justice and liberty; on the other, an unconditional submission to the present, and every future Administration […] who may indulge with ease and safety their propensity to speculation and spoil, and insult, while the people remain divided. 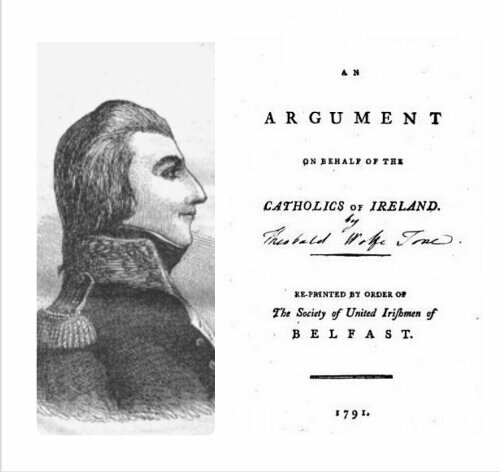 This pamphlet had an immediate impact, becoming both a “best-seller” and acting as encouragement to both Catholics and Protestants seeking reform. The same year the pamphlet was published, Tone and others founded the United Irishmen. Aiming first at forming political union between Roman Catholics and Protestants so that liberal parliamentary reform could be achieved, the organisation became more radical when it became clear reform by constitutional means was unlikely to happen. In 1798 they started a revolt, which was defeated. Wolfe Tone himself died in custody on 19th November 1798. In reaction to the 1798 Rebellion Westminster took direct control of Ireland with the Act of Union in 1801. The Irish parliament was no more. Full Catholic Emancipation had to wait until 1829, after a long campaign headed by Daniel O’Connell. There are many editions of Paine’s Rights of Man available, this version from USHistory.org is split into sections for easy reading. The first 16 sections relate to Paine’s 1791 answer to Burke. The rest was published as a second part in 1792. The first part of Paine’s Rights of Man also available from UCC. Paine’s full works (in four volumes) are available online here. A History of Irish Thought, pp. 208-210. More on the life of Wolfe Tone: a general overview and more detail and with a focus on his time in Trinity College.